The branch was never busy, either for passengers or freight. It is unlikely that leaflets were ever produced, as is the case today. Instead, tables were printed in the press, especially in the 19th century; this one from the Herts Advertiser. 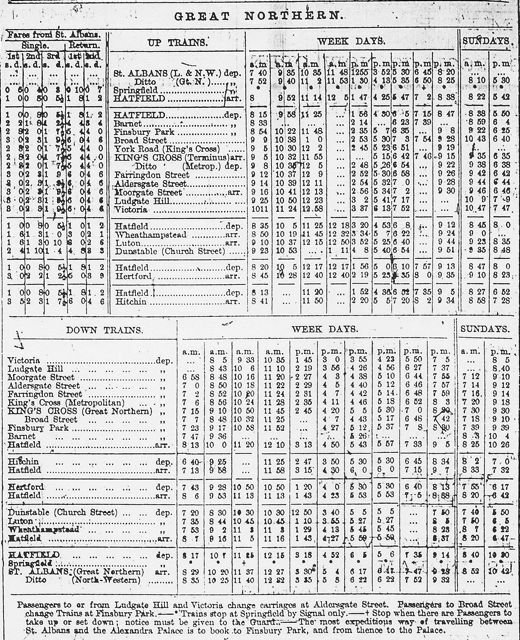 The table also shows connections between Hatfield and Kings Cross. Dug up from a garden built on part of the former yard at Beaumonts Farm. This may have been from a farm animal, but equally it could have been from one of the many horses owned by Edmund Coombe, a non-farming tenant, who lived there in the early 1900s. It is a reminder that all of us who live, or have lived, in the urban East End, do so because the farms on which our homes are built, were given up as uneconomic by their owners. Previously the city extended its boundaries as far as Lattimore Road, a full thirty years before the arrival of the Midland railway station. During which time housing had been raised on the Bedford Park estate and St Peter's Park. 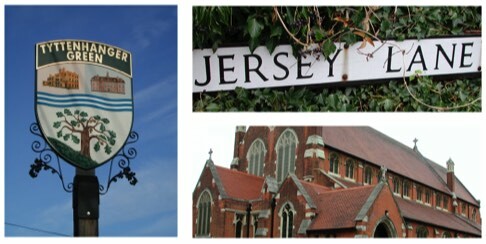 The council negotiated an expansion to roughly three-quarters of a mile from the Town Hall. The resulting added areas included land to the east of the new Midland Railway. Although still a nursery, the boundary cut right through it. When the homes were built, some house owners found themselves paying the city rate, while others paid the lower rural rate. Most of the posts have now disappeared. 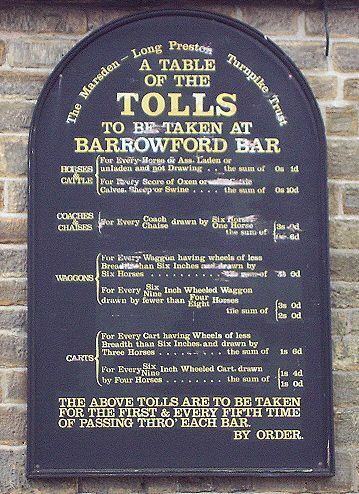 There is no known surviving tariff board for the Reading and Hatfield Turnpike. However, to illustrate what one may have looked like, this example from Lancashire has been used. Tolls and conditions will have varied from turnpike to turnpike and over a period of time, with heavy carts and herds paying the most; walkers paying only a nominal amount, or nothing at all. In places the tolls may only have been payable during daylight hours. 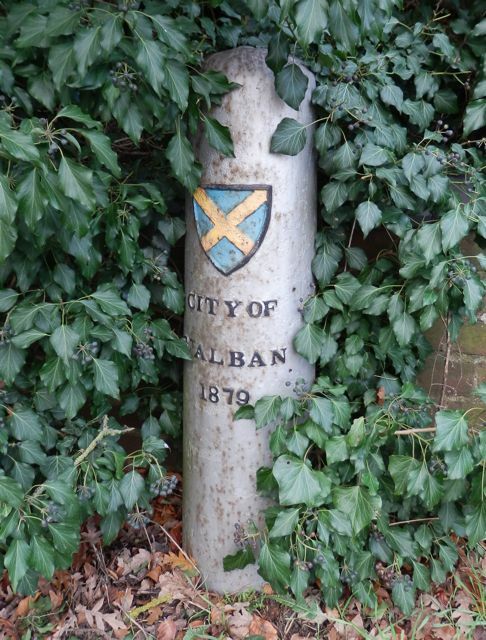 Most tolls on the east side of St Albans were paid on a side lane, but main toll points across the road were at the Fiddle (Hatfield) and Horseshoes (Smallford). 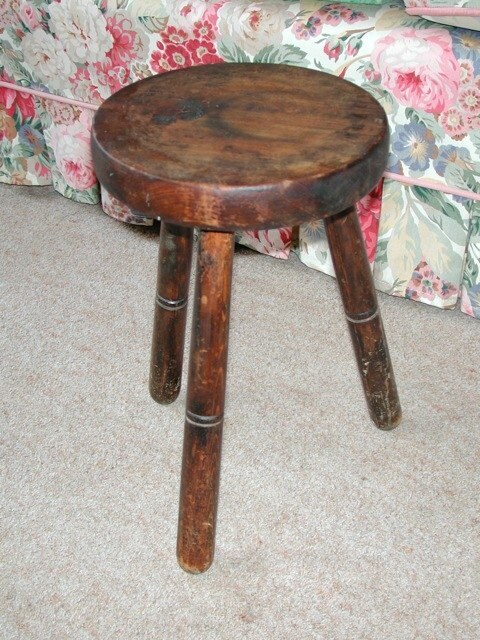 This utilitarian and typically agricultural item can now be found in many antiques shops, but was a mainstay at all small dairy and mixed farms until the dawn of mechanical milking. This particular piece found its way from Lamer Farm, Wheathampstead, to the bootmaker's house on Brewhouse Hill; thence travelling to various addresses in Wood Green, Tottenham and Hammersmith, before returning to Hatfield Road. It now features in a home at Jersey Farm residential district. The world of agriculture often finds its way into the suburbs. 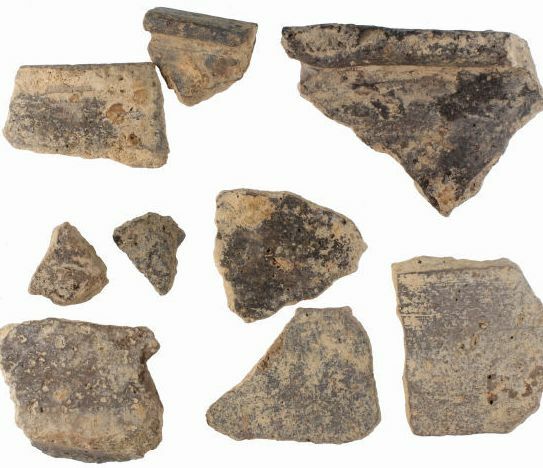 There is much circumstantial evidence of widespread pre-Roman settlement in the eastern districts; a number of finds as well, from archaeological digs. A resident of Salisbury Avenue was digging a hole in his garden to accommodate a bomb shelter. He discovered a number of interesting pieces and contacted Verulamium Museum. The clay pieces were from the first century AD, and associated with a Belgic hut of wattle and clay in the vicinity. The finds made by Mr Simmons are certainly the oldest in the Hundred Objects collection. This was a 19th century nobleman's carriage used for ceremonial purposes. 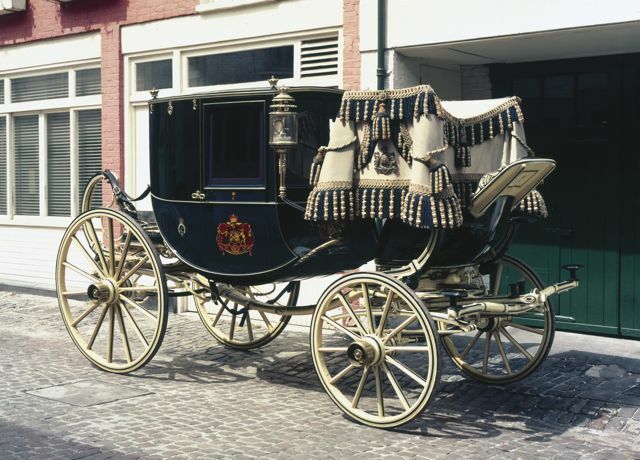 Dress coaches were drawn by a pair of horses, the elaborately dressed coachman in charge of one or two passengers. The coach was displayed at the London Science Museum between 1967 and 1997, to which place it had been on long-term loan, courtesy of the fifth Earl Caledon of Tyttenhanger Park. Many of its journeys would have been made to London, but no doubt it would have been seen on other roads occasionally. 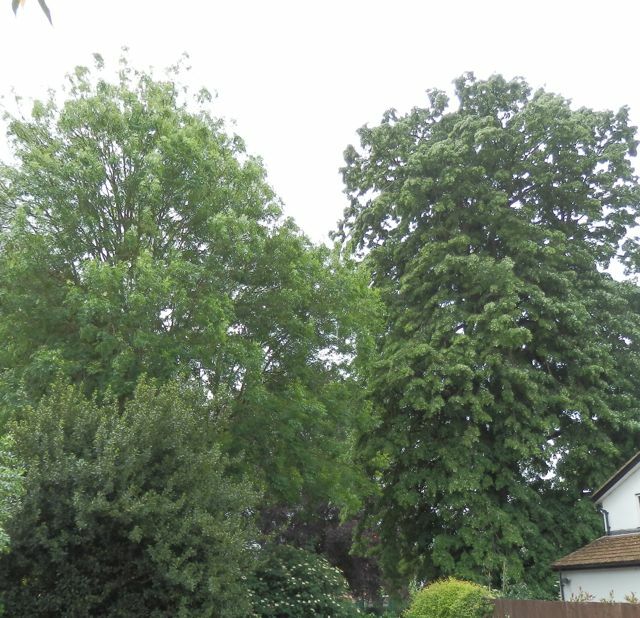 So many special trees scream for attention in the eastern districts. The Mexican Lime stands in what were the grounds of Orchid House, Camp Road. It was planted by Friederick Sander c1886, having been presented to him by the Royal Botanical Gardens at Kew. 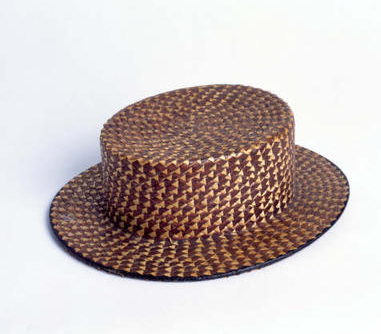 The hat may have been made in St Albans, in one of the many hat factories which spread here from Luton; but the raw material came from the fields in the eastern districts and beyond. This was home-working for girls and women in the villages and hamlets. The plait was prepared for sale to the dealers in town, who then sold it on to the factories. Industrial Schools in the town where accom-modated children to learn 'practical skills' (plaiting), alongside writing and arithmetic. Beaumont Avenue was always considered a private lane. 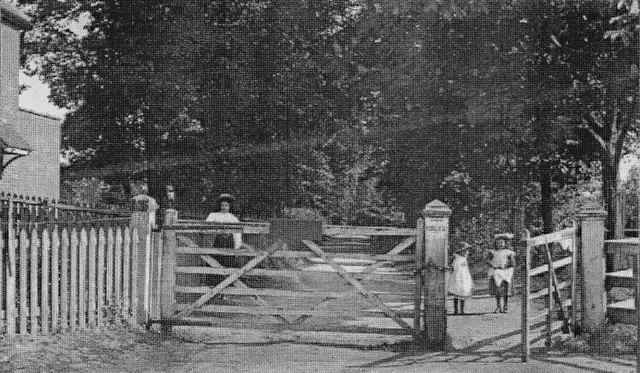 Land owner Thomas Kinder had wooden five-bar gates erected at both ends. The ones shown here were at the north end, outside the cottages. 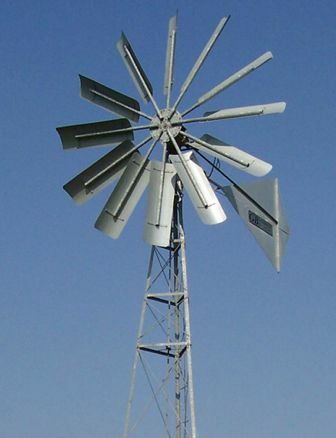 There is no record of when they were installed, nor when they were removed, although it is logical to think they were taken away in 1929 when the final part of the farm was sold for development. 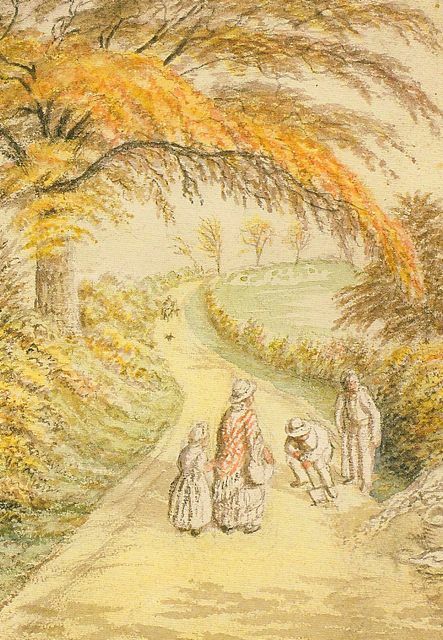 We are fortunate in having a number of local landscapes and studies by John H Buckingham (1800 to 1881). This example is Camp Hill, with the future Campfield Road on the left and Dellfield to the right. Courtesy Museum of St Albans. The nurseries developed from the mid 1880s on an extensive site at the foot of Camp Hill, and was held in high esteem for both the range, quality of plants and breeding programme. Many distinguished clients visited the site, and the company gave employment to a number of local people. The study is from the 4-volume Reichenbacchia, made famous by the exquisite illustrations by Henry Moon, Sander's son-in-law. 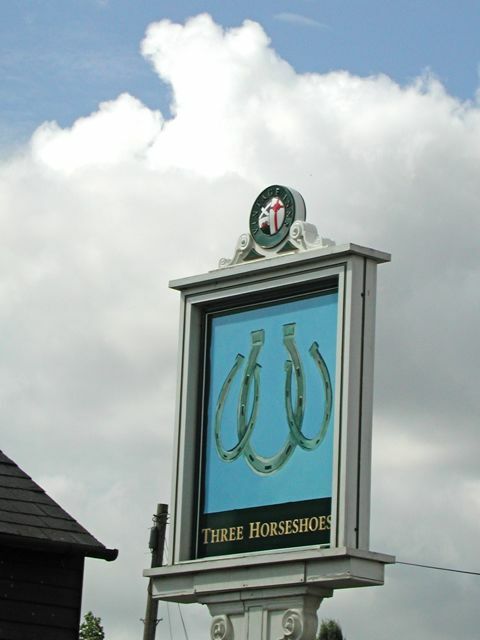 The Three Horseshoes public house was the first point any travelled to St Albans would encounter after leaving Bishops Hatfield. 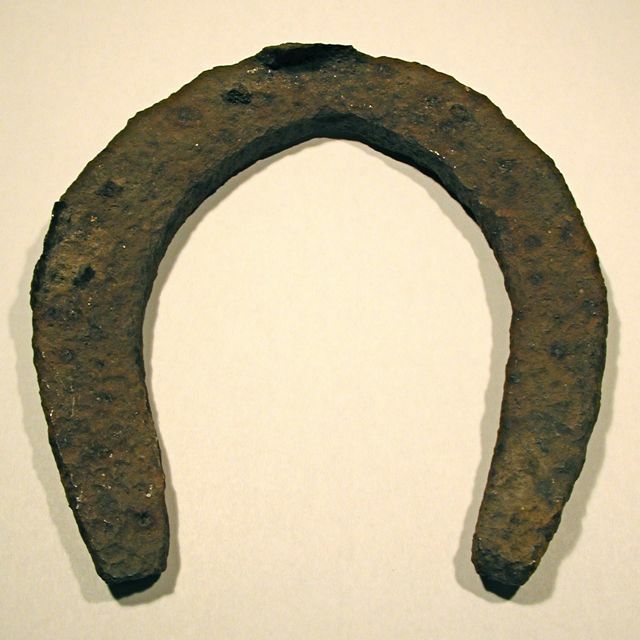 Smallford is a recently acquired name for the hamlet historically known as Horseshoes. At one time there was a beer house opposite: Four Horsehoes. Smith's Printing Agency was renowned for printing in colour, and received regular orders for catalogue printing by horticultural companies. Examples of such work have not been tracked down. However, one archived document in St Albans was the souvenir programme for the 1907 Pageant; a weighty tome not noted for its colour, of which there is none, other than on the cover. The title page confirms that the brochure was produced at the Fleet Works. The original houses built in Fleetville and Camp are now over a century old. Many windows and doors have been replaced, sometimes more than once. Those with original doors may or may not have their original door furniture. 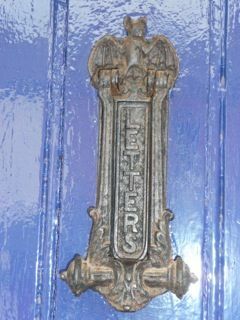 The concept of a letter flap built into the knocker was still a young one; hence the word LETTERS moulded onto the flap, for the avoidance of any doubt. Otherwise the choice of design was that of the house builder. Huge quantities of letter flaps incorporated into knockers came out of the industrial Midlands' factories and spread across the country. The stone was unveiled on the occasion of the opening of the workers' institute belonging to Smith's Printing Agency on the opposite site of Hatfield Road. The Institute building had been rendered, probably in the 1920s, and recent works had uncovered the inscription for the first time since then. The building's current owners have left the stone exposed. 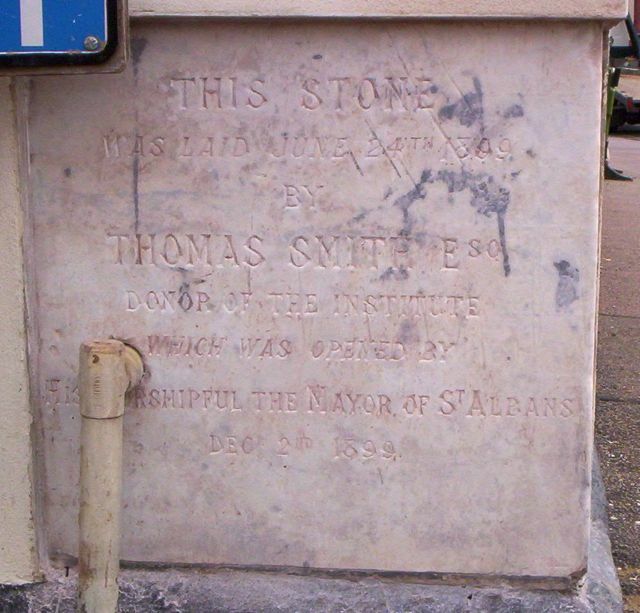 "This stone was laid June 24th 1899 by Thomas Smith Esq, donor of the Institute, which was opened by His Worshipful the Mayor of St Albans Dec 2nd 1899."